After dining at Rioja in Denver the previous night, we were left wondering where we should venture to next. 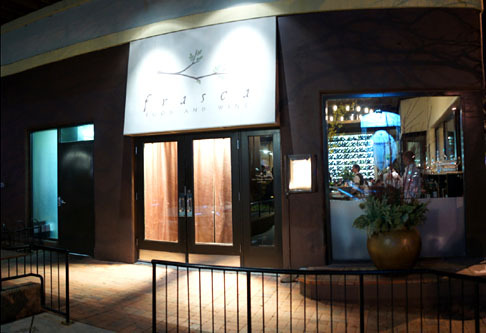 We queried Rioja's Executive Chef, Jennifer Jasinski, and she reassured us that Frasca was well "worth the drive" out to Boulder. And so it was. 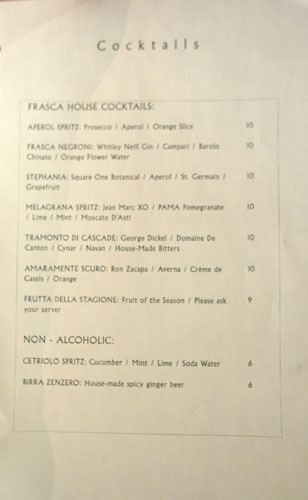 Named after the rustic, local, convivial eateries of Italy, Frasca is the brainchild of Chef Lachlan Mackinnon-Patterson and Sommelier Bobby Stuckey. The restaurant is firmly Italian in essence, but focused on the northeastern region of Friuli-Venezia Giulia. The area's proximity to Eastern Europe means that it's a place of immense culinary blending--the food takes cues from other parts of Italy, but also features influences from neighboring Austria and Slovenia. My first real exposure to the cuisine of Friuli-Venezia Giulia was at Pasadena's Trattoria Tre Venezie, where I enjoyed the meal that really began to change my perceptions of Italian food. I thus looked toward Frasca to push me along further in that journey. And of course, the fact that the restaurant was chosen as one of Gayot's Top 40 Restaurants in the US piqued my interest even further. About the chef: Lachlan began his professional culinary career at the Old Warson Country Club in St. Louis, MO. He eventually moved to Paris in 1999, enrolling at the prestigious Ecole Grégoire-Ferrandi in order to obtain his Certificate d'Aptitude Professionnelle in the culinary arts. Lachlan apprenticed under Benoît Guichard at the legendary Jamin, the very place where Joël Robuchon first made a name for himself (Eric Ripert worked here early on, as well). 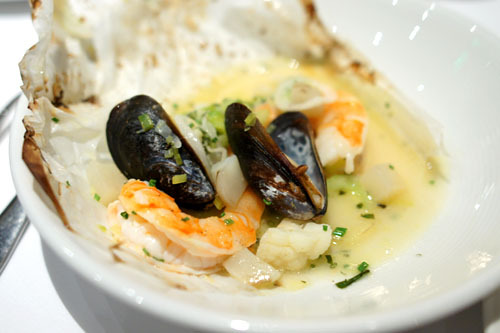 Later, in 2000, the Chef moved to Pont-Aven, Brittany to work at Guy Guilloux's La Taupinière. 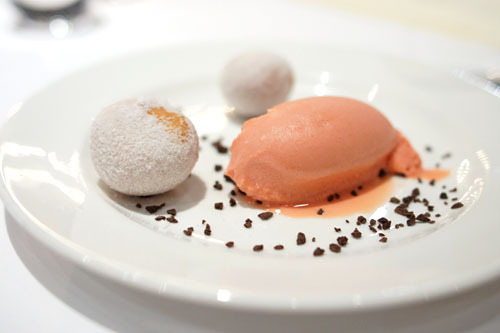 The next year, Lachlan moved back to the States to join The French Laundry as a chef de partie. It was here that he would meet future business partner Bobby Stuckey (winner of James Beard's Outstanding Wine Service award), previously from Aspen's The Little Nell. 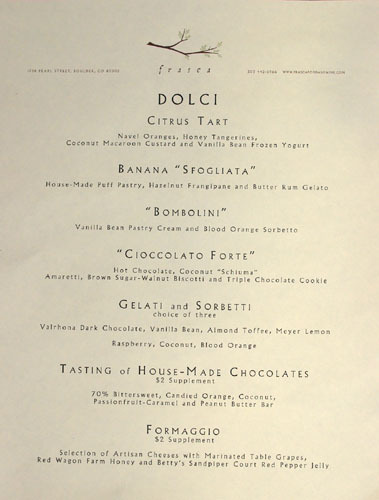 In 2003, the duo moved to Colorado to create their version of an American frasca; the restaurant opened the following year to considerable critical acclaim. The dining room is elegant, stylish even, but still recalls the warmth and friendliness of traditional Italian frascas. Diners should note the salumi bar off to one side, as well as the illuminated wine wall. 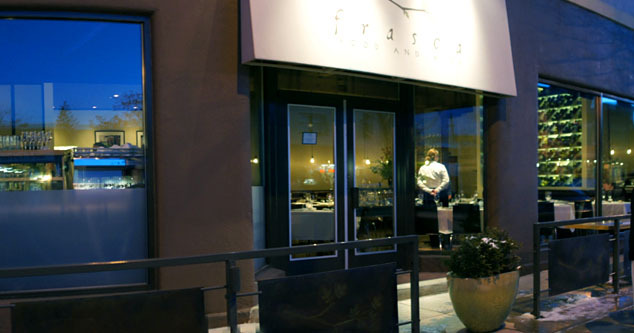 Frasca's seasonally-adjusted, locally-sourced menu aims to present the understated elegance of Friuli-Venezia Giulia cuisine. 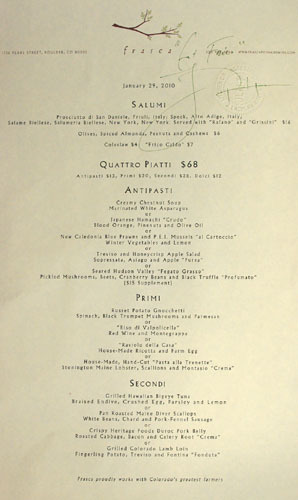 My preferred way to dine is to order the four-course Quattro Piatti [$68], and tack on a few supplements. Click for larger versions. 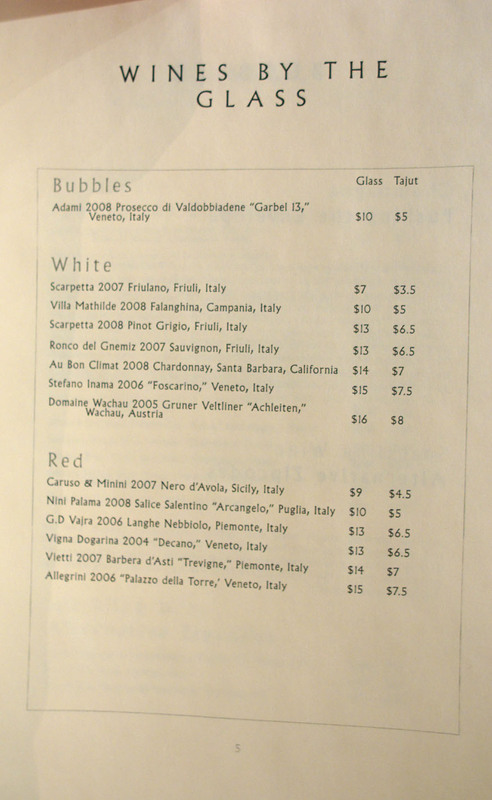 The wines by the glass list is short but sweet, focused heavily on Italian producers. Much appreciated is the offering of tajuts, basically half-glass portions of wine inspired by the tradition of drinking Tocai Friulano as an aperitif. Of course, there's also a more comprehensive list with over 200 bottles available. 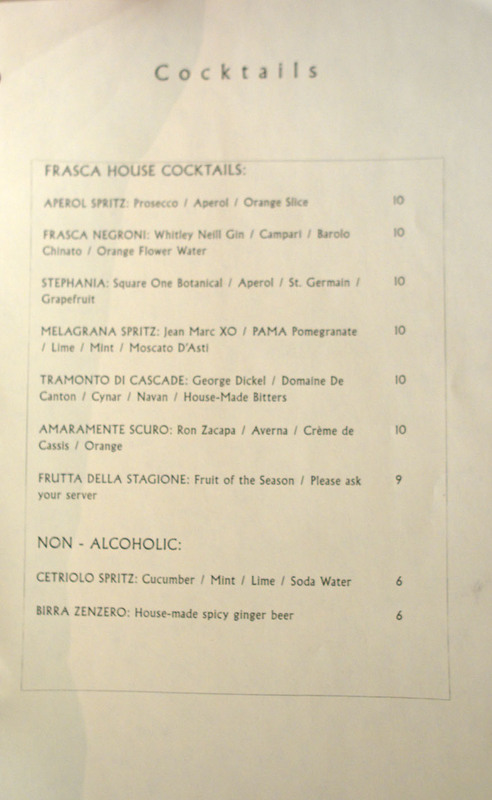 And although Frasca emphasizes the role of wine and cuisine, the restaurant does also offer an appealing assortment of cocktails. Click for larger versions. 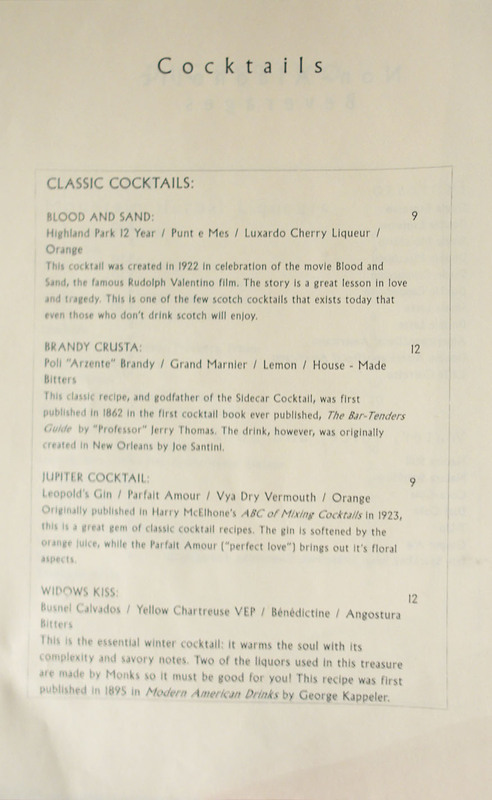 And to start: a Widows Kiss [$12], with Busnel Calvados, Yellow Chartreuse VEP, Bénédictine, and Angostura Bitters. 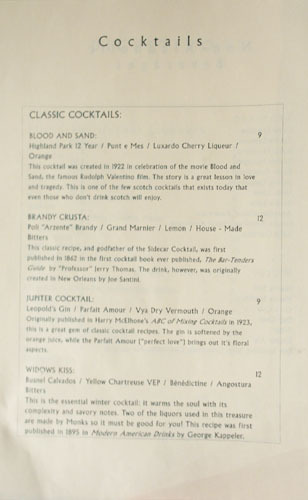 Described as an "essential winter cocktail," I loved its complex interplay of sweet, savory, and sour flavors. 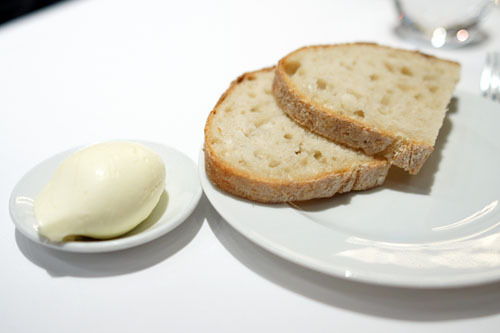 Bread was a solitary filone, a traditional, everyday Italian variety, served with a quenelle of superb, sweetish butter. To begin, we split an order of the restaurant's famous "Frico Caldo." Think of this as the best hash brown that you've ever had, sandwiched with a layer of Montasio cheese. 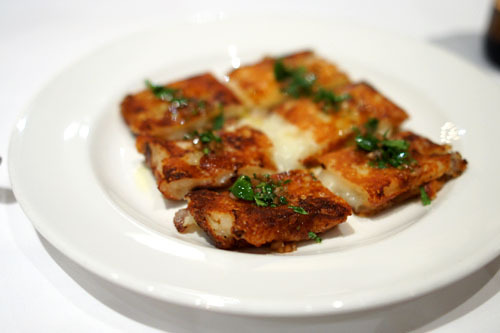 It's Frasca's version of the frico, a classic Italian cheese crisp endemic to the Friuli-Venezia Giulia region. I enjoyed the amalgam of rich, creamy cheese and starchy, firm bits of potato, perked up with a touch of onion and coriander. Simply superb--I could eat an entire plate! Salumi [$16.00] | Prosciutto di San Daniele, Friuli, Italy; Speck, Alto Adige, Italy; Salame Biellese, Salumeria Biellese, New York, New York. Served with "Rafano" and "Grissini"
Our second shared course was this lovely smorgasbord of meat, all sliced in-house at the salumi bar. 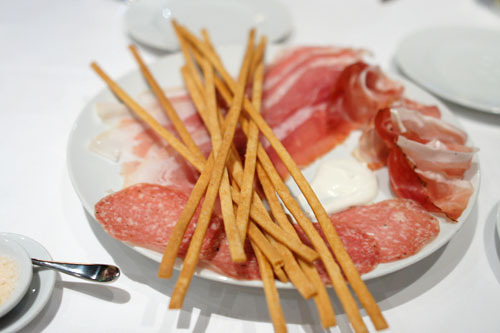 I started with the salami, a pork-based Piedmontese-style cured meat with a great, peppery kick. 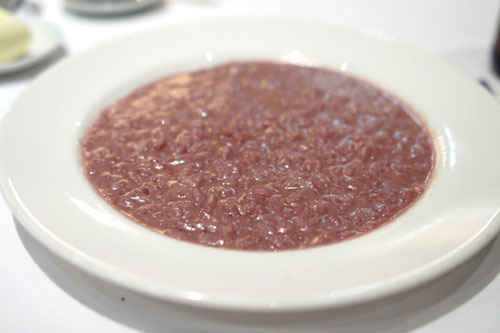 Next was the speck, the most strongly-flavored of the trio, imbued with a marked saltiness. The prosciutto, on the other hand, was softer and sweeter in savor. Finally, we had grissini (breadsticks), while the rafano referred to the accompanying creamy horseradish sauce. 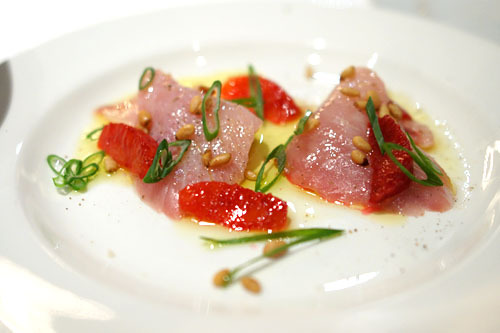 The first course of my "Cinque Piatti" was a crudo, a dish of raw fish first popular in Italy's seaside towns. The fish utilized here was our old sushi standby: yellowtail. I liked the use of pine nuts, with their nuttiness form a fitting foil to the slightly fatty, dense character of the hamachi. Meanwhile, I also appreciated the tartish sweetness conveyed by the citrus, and the weight imparted by the olive oil. Very nice. 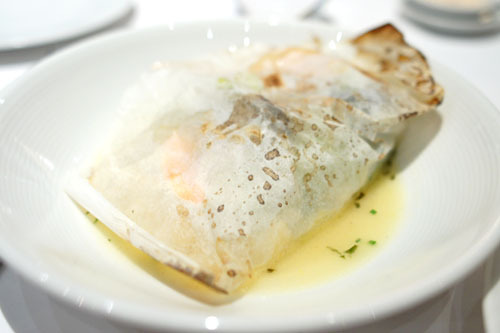 Al cartoccio refers to a preparation in which food is cooked in paper. This really helped seal in the flavor of the mussels and prawns, resulting an intoxicating burst of briny aroma upon unwrapping the parchment! I adored how the natural sapor of the seafood was so deftly preserved, while the various vegetables really helped moderate the fish. 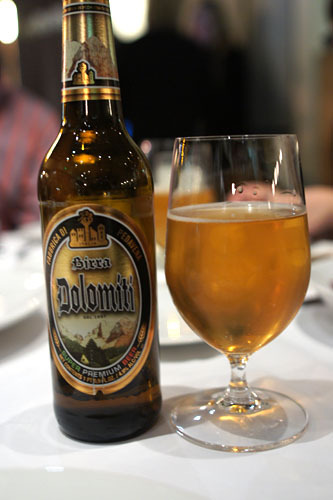 With my cocktail dispensed with, I turned to beer, specifically Birreria Pedavena's light, easy-drinking Dolomiti [$7], from Veneto. For my pasta course, I went with a risotto (natch), one made with wine from Valpolicella and Montegrappa cheese from Veneto. As expected, the rice was cooked to proper al dente consistency, with the wine adding a slight tang to the lush creaminess imparted by the cheese. Crispy Heritage Foods Duroc Pork Belly [$28.00] | Roasted Cabbage, Bacon and Celery Root "Crema"
And now, for the "main course," we have a fantastic preparation of pork belly. I loved the interplay between the tender, yet fibrous flesh and its delightfully crisp, savory "crust". 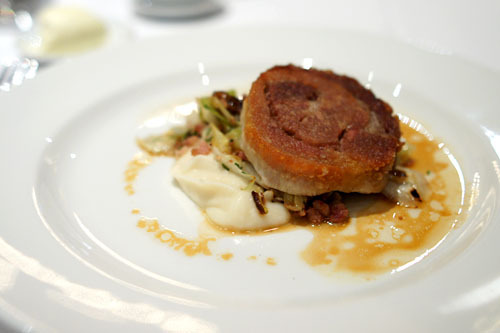 The flavor was also spot on as well, and I appreciated the use of the tart cabbage to offset the pork. The celeriac, however, was not necessary. Definitely one of the best pork bellys I've had in a while. 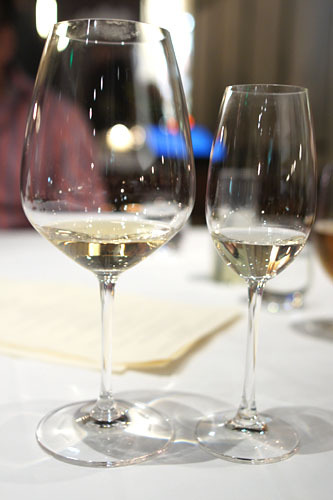 A meal at Frasca just wouldn't be complete without some vino, so I ordered up two tajuts. First was the Domaine Wachau 2005 Gruner Veltliner "Achleiten," Wachau, Austria [$8], a crisp, mineral-laced wine with some juicy stone fruit and pepper notes. 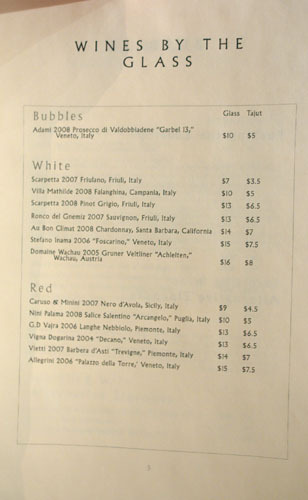 I also had the nicely dry and acidic Adami 2008 Prosecco di Valdobbiadene "Garbel 13," Veneto, Italy [$5]. 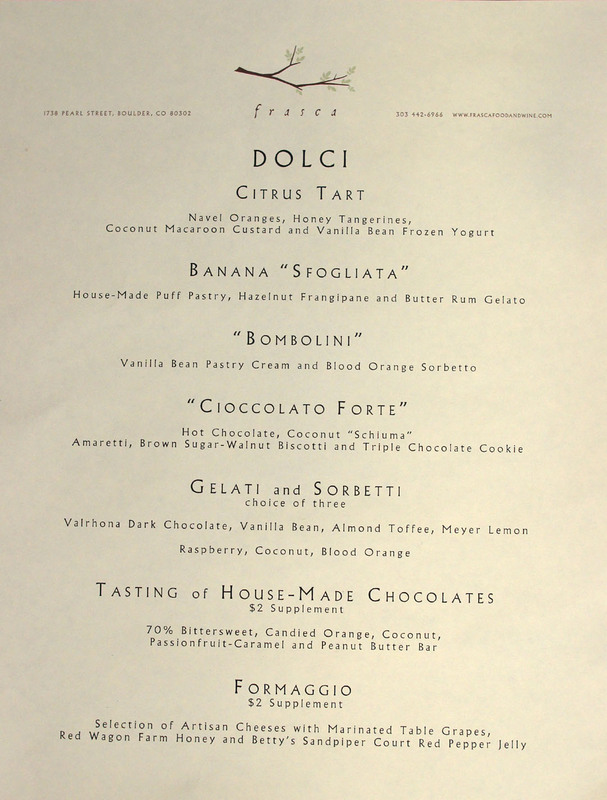 For dessert, I had the bombolini, basically fried bits of filled pastry--"doughnut holes," if you will. They were simply delicious, with a beautiful fried texture and an added luxuriousness courtesy of the vanilla cream. The sorbet, meanwhile, lightened things up with its bracing citrus smack. So how did I enjoy my meal here? Very much, actually. Chef Mackinnon-Patterson really does the food of Friuli-Venezia Giulia justice here, effectively conveying the sense of rustic refinement inherent to Friulian cuisine. 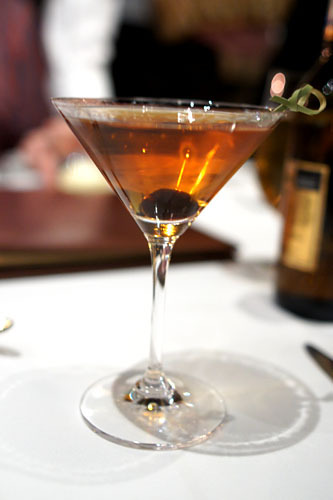 The flavors are straightforward, yet sophisticated, contemporary, yet true to the traditions of the region. 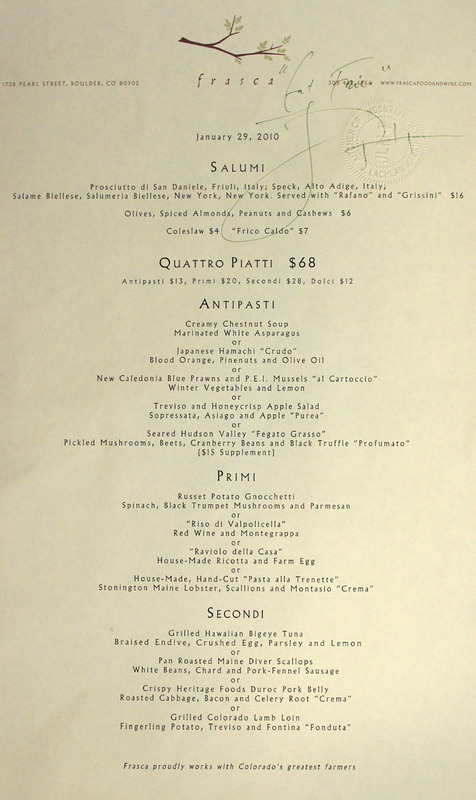 I can understand why Frasca has received all the accolades that it has over the years--if I'm ever in the area again, I'd love to make a return visit. Definitely sounds like it's time for us to visit the relatives in Boulder. Jo: Yep I saw the photos from that dinner. Looks like you had a great time (but then again, you always do)! Penelope: If you visit, then this is the place in Boulder! One of my readers suggested Black Cat and The Kitchen as well.